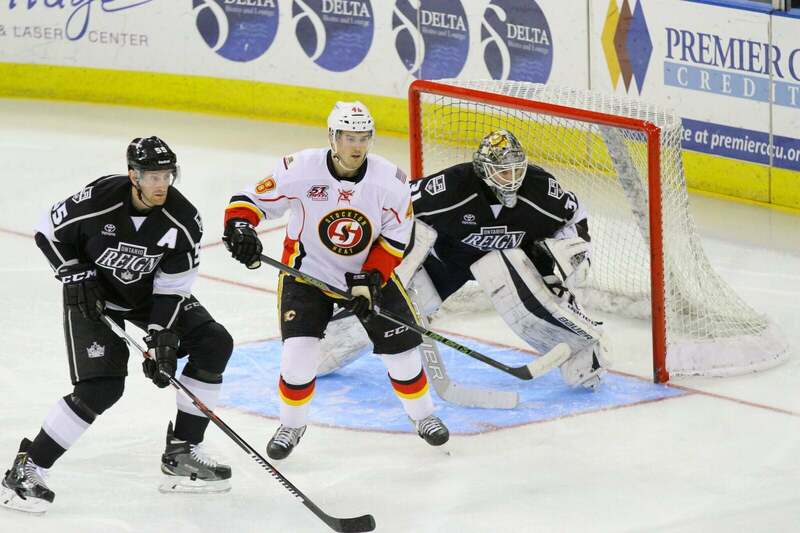 The Ontario Reign (41-18-4-1) captured the 2015-16 regular-season Pacific Division title with a 4-1 win over the Stockton Heat (30-29-2-2) Wednesday evening at Stockton Arena. After a scoreless first period, the two teams erupted for five goals in the second frame with the Reign taking a 4-1 lead into the intermission. Michael Mersch and Nick Ebert opened the scoring for Ontario with back-to-back power-play goals early in the period. Mersch redirected a Jeff Schultz shot from the point for his team-leading 23rd goal of the season at 3:05 and Ebert’s tally banked off a Heat stick at 5:15. The Heat responded by snapping the Reign’s penalty-kill perfection streak (51-for-51 over the last 14 games) with a man-advantage marker from Bill Arnold at 12:54. Moments later, Derek Forbort reclaimed a two-goal advantage for the Reign, blasting a shot past Heat goaltender Nick Schneider from the right point at 16:02. Less than a minute later, forward Sam Herr made it 4-1 with his first professional goal in just his second pro game. Reign goaltender Peter Budaj earned his AHL-leading 39th victory of the season with a season-high 46 saves. The Reign finished the game 2-for-3 on the power play while the Heat went 1-for-3.